At home on the road or trail with an innovative tread design that rolls well on pavement while offering great traction on dry dirt. A great choice for commuting, touring, trail riding even dry cross racing. These tires are just what I was looking for. I wasn't able to ride on dirt and gravel Rds. with the tires that came with my bike. I can now ride on the PA State Forest dirt and gravel Rds with my new Michelin Transworld Sprint tires. They work well on smooth surfaces too with little rolling resistance. Thank You Western Bike Works. I commute almost 9 miles to downtown Phoenix. Finding a smooth, safe route is challenging but the unique tread pattern on my Michelin Transworld Sprint Tires gives me the security and peace of mind I need no matter how bad the road conditions are. I frequently encounter potholes, cracks, uneven pavement, unexpected patches of gravel, broken glass, not to mention goat-head thorns. I haven't been able to avoid all of these hazards, but when you look close at my tires it looks like I've only been on new, perfect pavement. Makes me look like a pro! When I ride on a nice surface these tires roll real easy, too. I've only ridden on the City's vast system of desert trails a few times, but so far I'm finding that the side mountain bike treads hold their ground. I would never try to take corners in loose sand and gravel with a pure street tire. These Michelin Transworlds truly live up to their name and give you the best of both worlds. I'll write back again if I find something I don't like. Even the price was amazing, and if the price doubled, I'd buy them again. Excellent tire for riding from asphalt to the crushed limestone base trail where durability is key. The narrow width helps riding the hard surface like a road tire would. Mounted on 29er rim works well on pavement prior to crushed limestone surface trail priced on the cheap but rides like a winner. On my single-speed commuter, work great for winter riding in Pac. NW where we have variable road conditions. A bit heavy but great for the budget. This is not a long lasting tire at all. It is not puncture resistant at all. I am not using them any longer. Move up to a better tire. I found that I went through so many tubes in the 6 month span that I used them, that it didn't pay to go cheap. Pros Runs true to size, Easy to mount, Reflective sidewall available. Cons Doesn't work well with fenders due to lugs hitting fender rods, Reflective stripe is wobbly, Not too flat resistant. 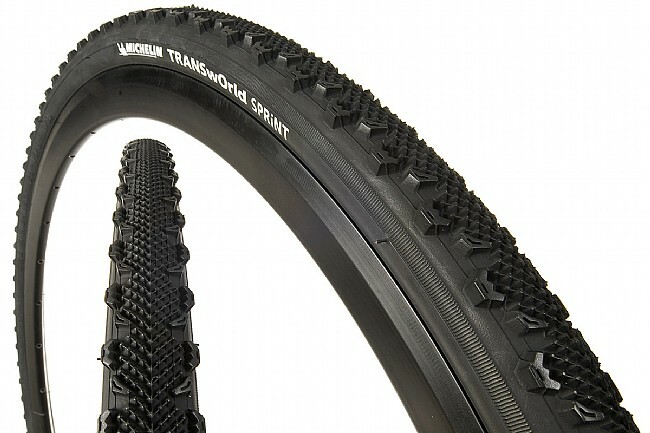 I bought a pair of these tires thinking to mount them on my commuter bike. I had lots of trouble with fender clearance. When I finally got them working I was fairly pleased with them, as they aren't slow feeling, and I can mount and dismount without tools. Then after only 800 miles, I got my first flat. Glass had no problem penetrating the casing. I can still use the tire, so I will keep it on the bike. The fact that the tire could be dismounted with no tools meant the tire was off the rim in seconds, and I was back on the road quickly. 30 of 30 customers found this review helpful. After a frustrating first Winter of bicycle commuting '06-'07 I began using these as my snow tires and they work great. I like the design since they will primarily roll on the smaller, smoother tread when on bare pavement but the large side tread comes into play when there's any snow on the ground. Nothing but studs work on ice, of course, but these are very stable in snow. I've used these now same tires, in fact for three Winters.